I had such a fun time making this card! I think it was a sketch challenge on MFT I think. I saw the sketch on SCS and I believe she mentioned MFT. Anyway story behind the card: I needed to make a card for a very good friend of mine Rita. Since we've been in Germany she's always done little things to make our transition over here better like always inviting us for dinner, bringing me home made lumpia which is the BEST i've ever had. They always want to take us to see new sights, and she has called or text me every single day since being here to make sure I'm ok or if I need anything. I thought the saying on the bottom of the card was perfect! Because even though they may seem like little things to others it's been a HUGE little things to me. I am so appreciative of her and her family. I think I will make her something chocolate cause she is a chocolate gal! Probably some home made Mocha Cupcakes from Batter-Splattered blog that I love! You can find the recipe here. I have made these and they only make 9 cupcakes so double your batter because let me tell you they will NOT last 1 day. They are the best chocolate cupcake I've ever tasted! For my card I used Purely Pomegranate as the base, matted a piece of printed cardstock from my wonderful Pocket Full of Posies stack by Die Cuts With a View. I then cut squares in Soft Sky, Summer Sun, Purely Pomegranate, and Whisper White. I layered them and on the Whisper White piece I stamped the heart from the A to Z Accents by Stampin' Up! in Purely Pomegranate on all four corners. I punched out a scallop in Summer Sun, used my circle punch for the Whisper White circle and stamped the big ladybug from Little Lady set by Papertrey Ink. 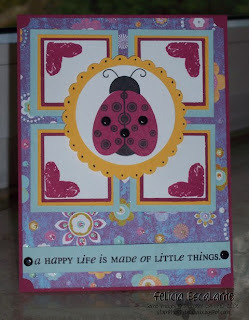 I used 3 black brads from the vintage brads by Stampin' Up! on 3 of her spots to give her a little depth. I can't wait to give Rita this card on Friday!